Today's Draw: Three of Rings (Pentacles) in the Past Life position from the Wickwillow Tarot and the Deck of 1000 Spreads. 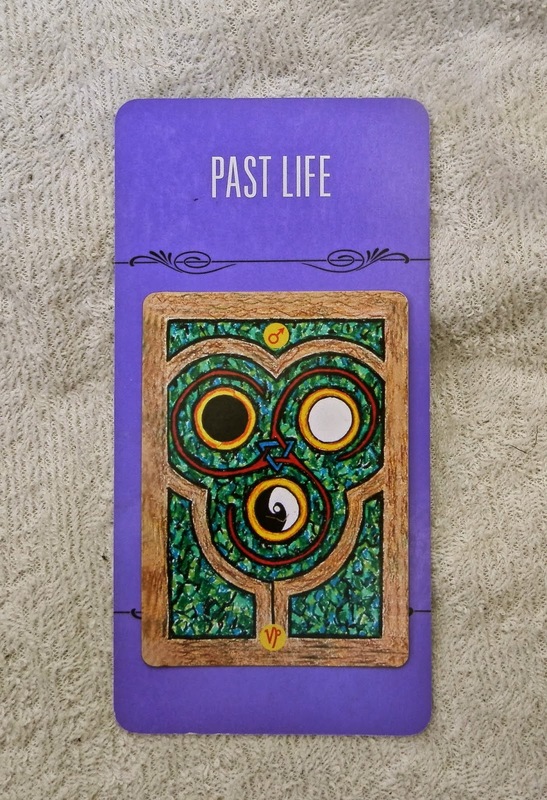 What can past lives tell you about the life you're living now? What things have changed and what have remained the same between lifetimes? And how are the lessons you're learning now shaping you next life before it even begins? Just before I drew today's cards, I was trying to figure out what class I would teach at the end of October. I wanted it to be Halloween appropriate, but nothing too hard to put together. I was already thinking in this direction, but drawing the Three of Rings in the Past Life pulled it all together for me. Hal Weeks, the creator of the Wickwillow Tarot, describes the Three of Rings as the "third thing" that is created when two different and separate things come together. We've discussed this thought a few times on the Daily Draw. Sometimes I talk about it in relation to how we tend to limit ourselves to an "it's either this or that" kind of mentality, but there are an infinite number of third things in there that expand our options. Keeping your mind open to that is keeping your mind open to miracles. Other times I talk about the third thing in the sense that we tend to judge or label things and this labeling means we either declare something good or bad, or nice or mean, or whatever and usually it's the third thing between the two. So today is an overcast day with beautiful temperatures. Some would call it a beautiful day. Others would call it a disappointing day. But it's really just a day. And labeling it crappy cuts us off from appreciating it. And labeling it beautiful might make us feel bad about all the work we have to do that keeps us from enjoying the day. So labeling it at all limits us. It's the third, or really the base, element that ties the two together...it's just a day. And that third thing is truer than "good" or "bad". It is what it is. But even without the class, you can do it for yourself. If you've ever had a past-life regression, use the data from that to draw a line between who you were then and who you are now. For example, I did one once where I was a sheriff and quite controlling and intimidating. In this life, my leadership style is less controlling, though sometimes confrontational. And instead of policing the legal way a life should be led, I'm offering options to consider for the spiritual way a life *could* be led. So some lesson I learned in between the two made me softer and more inclusive. I've let go of needing to be "the only way" or "the law". And in that lifetime, nobody really liked me and I didn't care. In this life I'm learning to find a place between the two extremes of not caring if anyone likes me and caring too much. 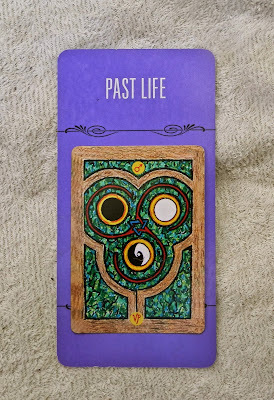 I had that particular past-life regression maybe 20 years ago and it has very much inspired the creation of a "third thing" that isn't that past life and isn't who I was before I was regressed. The insights from that session changed me in some way. If you've never had a past-life regression, do one of the ones you can find on youtube. Or just let your inner guide guide you. First of all, think about an old-time profession, era, style of dress, type of music, language, etc. that you feel strangely drawn to for some reason. Chances are, it's a clue to a past life. Once you have an idea of what that might be, see if you can observe that life in your mind's eye and just trust that what you come up with is valuable information to help you through the exercise. Then draw lines between that life and this as I did above. As much as I talk a good woo-woo game, there's some skeptic in me. So I can't say I'm 100% on board with any of this stuff. The sheriff would probably have closed his mind to other possibilities, but I leave mine open...haha. The conclusion I ultimately drew with all of this is that it doesn't matter whether the insights are real or not. They're still insights...the third thing that ties the polarities together. And if those insights bring greater peace and understanding, then more power to them. In the end, we just don't know for sure. So all of it is our own personal lore. As long as it's lore, why not open to the infinite field of third possibilities and see what makes sense...for now? The nice thing about the "the third thing" is that we can always change our minds without leaving behind an ideal or firmly held belief. Holding on tight to polarities makes it much harder for us to change and grow. Considering the gray areas in between is where all the fun happens.